In the current issue of Gettin’ Out, which is published here in Idaho, I have an article entitled, “Two for One with Tommy” which is about a special sharptail hunt my son Tommy and I shared together last fall. Grouse hunting is great in and of itself, but when you have your only son along, it makes it that much more special. If you haven’t subscribed to Gettin’ Out yet, here is a link: www.jaredscottoutdoors.com/Gettin–Out.html. This is my second article in Gettin’ Out. The first was “Eden Dawn,” which was first featured on Upland Equations. 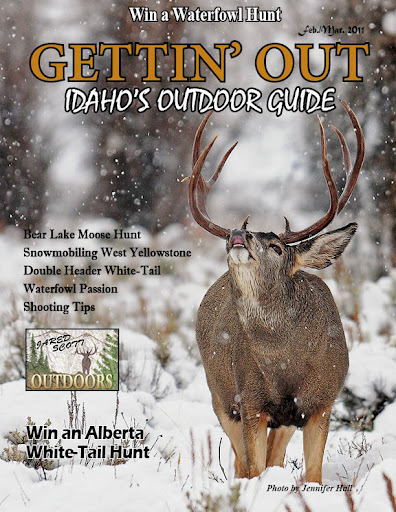 Gettin’ Out Magazine is a new magazine about hunting and fishing in Idaho. “Two for One with Tommy” is in the February/March 2011 issue. 2. “Sometimes Groused” (which can be found in the archives of Upland Equations from last year) will be featured in Gettin’ Out in the June/July issue. This article goes out to all those hunters who have experienced a day when everything goes wrong, but you still love every second of it. 3. In the Summer Issue of The Upland Almanac will appear my article entitled, “Grouseketeers” about my first grouse hunt with my then four year old son, Tommy. I wondered if this article would ever see the light of day so getting this one published is extra special for me. I think any dad who has taken a child hunting will get a kick out this article: “Shoot the gun softer, Dad!” This is my second article in The Upland Almanac. My first was “Roadside Revelations” which appeared in last fall’s issue. 4. Most likely, in the Winter issue of The Upland Almanac will appear my article, “Discovering Tinkhamtown,” which is a piece I wrote regarding some little known facts about Corey Ford’s classic, “The Road to Tinkhamtown.” Some of you may recall that this piece was originally published on the Upland Equations blog last January. However, once it was tentatively accepted for publication in The Upland Almanac, I removed it. I’m proud to announce that one of Bob White’s paintings will illustrate this article. The Upland Almanac is one of the finest magazines out there for the upland game enthusiast. I would recommend it to anyone: http://www.uplandalmanac.com/. I’m excited to share Heaven on Earth with the world and I hope that there are those outdoorsmen who will appreciate the book and relate to its message. I’ll keep you posted when it comes out. Well, that’s what I’ve been up to lately. For those who follow this blog, thanks for all of your support. Next Post Two Flies to Live & Die For!